La Terrasse, at the Bellevue Palace in Bern, Switzerland features an elegant ambience that is a study in stunning attention to detail that focuses on involving all of the senses. Dining room details include a domed ornate plasterwork ceiling graced with crystal chandeliers, sconces to add a warm glow to the wood paneled walls, and a wall of Palladian windows and doorways that lead to a large terrace with rewarding views of the mountains and city of Bern. Blue upholstered chairs flank white damask linen draped tables adorned with white and pink reverse roses with baby's breath, and white tapers set in tall crystal candlestick holders complement the navy carpet flecked with gold stars. Windows dressed with blue and gold floor to ceiling fabric, as well as the electrified crystal candelabra set on the wide windowsills add interest to the room, and piano music completes the gracious ambience. 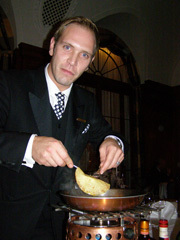 Edward F. Nesta and I had an excellent dégustation dinner at the 16 points GaultMillau restaurant La Terrasse during our stay at the hotel in October 2006. Our sommelier, Esther, began our evening with an aperitif of Jacquart Mosaique Brut champagne. Moments later, our server Marcel Pierre rolled his bread trolley to the table and offered us warm "Bern buns," which of course we had to sample. There is something about warm bread fresh from the oven that is hard to resist, so why try? The first "regard from the kitchen" was an Amuse Potage (Chou Frisé), (Cream of Green Cabbage Soup) served in a white bowl with a silver lid set on a paper doily covered plate and presented by a white gloved server. For our first course, we had Blanc de turbot grillé, Feuilles de radiccio rosso à la vinaigrette au Balsamico, Crostini au pain d'olive, (Grilled Turbot with red chicory served in a Bibb lettuce cup with olive bread), paired with a 2005 Gerald Clavien Chardonnay, Miege Sierre, Switzerland that spent six months in French oak. Our second course was Langoustines sautées Braisé de jeunes fenouils à la crème (Sautéed Norwegian rock lobster tails with fennel cream) presented on a scallop shaped white plate, paired with a 2004 La Poussie, Baron de Ladoucette, made with Sancerre and Sauvignon Blanc grapes from the Loire Valley, France, with mango on the nose, and rich melon and tropical fruits on the palate. Edward continued with a third course of Chicken with grilled polenta with Parmesan cheese and mushrooms, and I had the Coquilles St. Jacques (Scallops in puff pastry with spinach and garlic). Both of our courses were paired with a 2004 Molina, Cotivelli Weinbau, Malans, Grison, Switzerland, made with seven types of grapes: Diolinoir, Gamaret, Pinot Noir, Merlot, Cabernet Dorsa, Cabernet Cubin, and Cabernet Doria, aged 15 months in the barrel, with a deep plum color, with deep black rich fruits, tobacco notes, and heavy tannins. The chef took advantage of the season for the fourth course for Edward, Dos de bau droie rôti Nouillettes au safran Epinards en branottes (Vension with a pool of blueberry sauce, saffron noodles topped with brussel sprouts with sliced mushrooms), while I selected the halibut in a cream sauce with caper berries, saffron noodles and spinach. Being in Switzerland, we had to indulge in cheese from the Chariot de fromages Corbeille de pain (Cheese trolley) with a selection of 13 cheeses, most from Switzerland, and a few from France, Italy, and Spain. Cheeses included Emmentaler, Gruyère, Vacherin Mont d'Or, Vacherin Freibourgeois, Appenzeller, and Manchego, which we paired with a 1998 Château Haut-Bailly, Cru classé Bordeaux, Pessac Léognau/Graves, made with a blend of Merlot, Cabernet Sauvignon, and Cabernet Franc and barrel aged for 18 months. 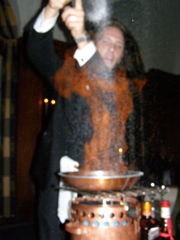 Our gastronomic evening culminated with a pyrotechnic show, well not exactly, but it certainly was a grand show as the maitre d'hotel, Mr. Zimmerman perfectly flamed Crêpes Suzette tableside, which he paired with a 1999 Château du Hayot, Sauterne, from Bordeaux, France. As a final note, the pianist came by our table and asked if we had a request for him to play. Edward requested my theme song, "The Girl from Ipanema," which was a lovely way to end a most enchanting evening. 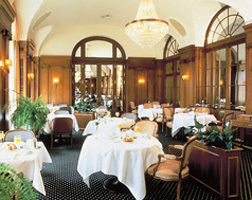 Read other articles on the Hotel Bellevue Palace, Bern, Switzerland in the Hotels and Resorts and Chefs' Recipes section, where Executive Chef Heinrich Lauber shares a few of his recipes. The Bellevue Palace Bern is part of the Victoria-Jungfrau Collection, www.Victoria-Jungfrau-Collection.ch.